Looking so pretty and very stylish! Your cape is perfect and earrings are gorgeous accessory to this lovely outfit! Very elegant and chic look! I love the added patterns and colors. Those SW boots look fabulous on you! I almost got a pair earlier this year. Maybe I'll take the plunge in 2015 :) Have a happy new year Krystin! Love your outfit! Cute cape! I love this look and I especially love the way you tied that scarf - super cute! This is such a sweet look. 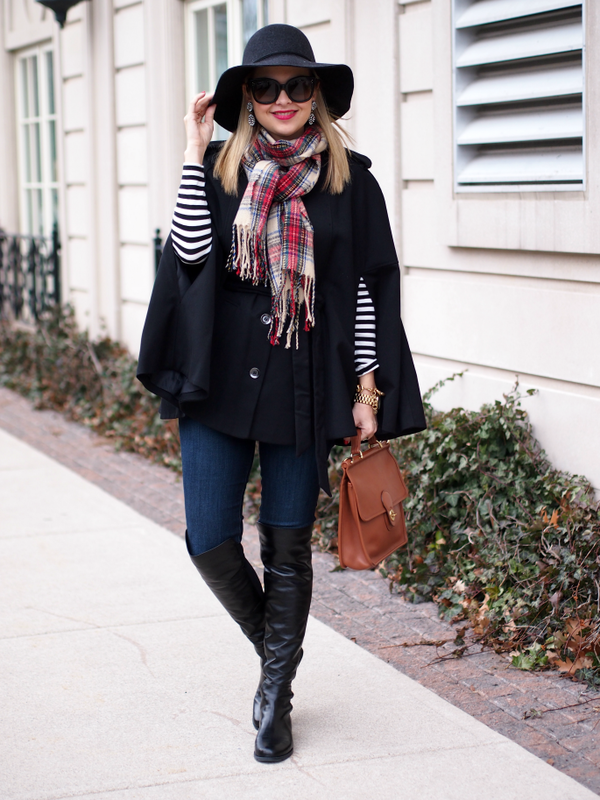 I love the pops of color in the scarf! And that cape is too darn cute! I love how you mixed the textures and prints in this look! First of all i'm so jealous of your boots. I have wanted 5050s but in the 'Pyrite' shimmery gold colour for a while. Ugh. My bank account says otherwise right now. Yours look lovely! Stunning floppy hat! I love your earrings as well! I'd love to see how you pair these boots with a pencil skirt! Love everything about this look! So gorgeous! Perfect styling! Happy, happy New Year to you, Krystin! This is such a gorgeous look and I love the scarf mixed with the cape!